In my books I’ve been a strong proponent of saving images in a fixed file hierarchy pretty much since the first day I started using digital cameras (that would be back in the late 80’s). Products like Lightroom and Apple Photos have a tendency to mask where your images actually live. I don’t like this. I want to know where my images are and control how they’re organized, because that helps me find them faster. I note that Scott Kelby has a new course he’s teaching for Lightroom called SLIM (Simplified Lightroom Image Management), and the foundation of that is basically a fixed file hierarchy that he then maps directly into Lightroom. Thing is, you need some sort of plan, and some reasonable thinking about what might be coming down the pike to build a folder structure that works. 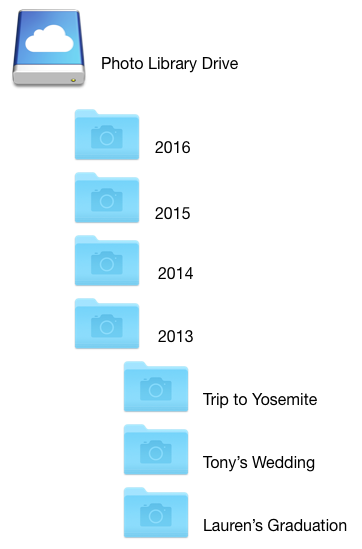 Technically, I probably should have had just one Rocky Mountain National Park folder and then individual trips within that, but my trip schedule really didn’t get out of hand until recent years. Now I have a pile of folders that should be slightly better organized at the lower levels. Since I don’t have everything hooked into Lightroom, I very well may just reorganize my file structure next time I move my files to new RAID drives. In my International Travel folder, you’ll find sub-folders by continent, then country, then place within the country. In US Travel you’ll find folders by state, then place within the state. I’ve been doing that now for almost 30 years, so all I need to remember is where I took a photo, even vaguely, and I can often find it very quickly just by browsing in Finder. The point that needs to be made here is simple: you need an organizing principle for creating folders to contain your images. Don’t just start slamming everything into the same folder. It doesn’t matter if you copy my structure or create your own. Actually, you should always create your own: only you know how you think about the places/events/people you shot and how you’d search for them. Note that I can type “2013 Rocky Mountain” into Spotlight on my Macintosh and it’s going to pull up that folder. 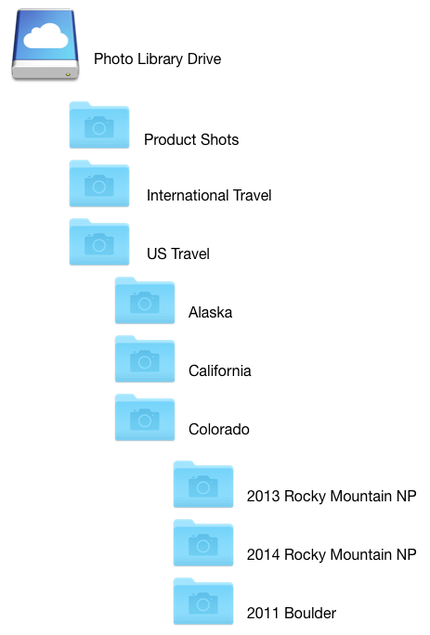 I don’t need Lightroom or another product to find where something is because I’ve been consistent in naming folders and files themselves (for example, in the 2013 Rocky Mountain folder you’ll find files named US_CO_Rocky Mountain_DATE_CAMERA_SEQUENCE#, so I’ll be finding files as well as folders). This is actually one of my longstanding tips on how you name things: how would you search for it using a search string? If you answered “Botswana Moremi 2016” then those things better be in the folder and file name hierarchy you create. Date — if you take only a few shots at a time, I’m not sure date helps you a lot. Date sometimes helps a lot when you have multiple similar events on different dates (e.g. sports). Place — obviously travelers going to lots of places are going to gravitate towards this, but again think about how you remember something. If it’s by place, then place needs to be in your hierarchy and naming. Event — I’d argue that most people should consider this one first and foremost. A lot of photography is event driven. And you’ll be searching for those photos later based upon the event (“hey, I never saw those photos you took at Grandpa’s 75th birthday party”). Date+Event is a common organization system. Person or People — If you’re mostly photographing friends and family, this obviously is a potential organizing principle. Likewise if you’re a portrait photographer (but see next). Client — There’s a strong reason to organize by client if you’re a professional. If you do this right you can let them browse just their photos (and not those of other clients because you’ve set the permissions accordingly), or quickly clone and send them their photos. Don’t let your images just start filling random file folders or sprawl across multiple hard drives. That’s a recipe for eventual disaster. Build a single drive with a folder hierarchy that makes sense, and put images into that structure logically and consistently. Back that drive up regularly (both on site and off site). You’ll be glad you did.